Did Russians use the US political system to fuel political discord in the Balkans? A former Trump campaign aide working as a lobbyist, a half-million-dollar payment, a conservative Albanian political party, four Republican congressmen, Breitbart News, a kosher restaurateur in New York City, an online dating service that promotes “beautiful” Ukrainian women, and Russian-linked shell companies—these are some of the elements in a bizarre tale of influence-peddling that spurs the suspicion that Russians covertly used Republicans in Washington in an effort to foment political conflict in the Balkans. 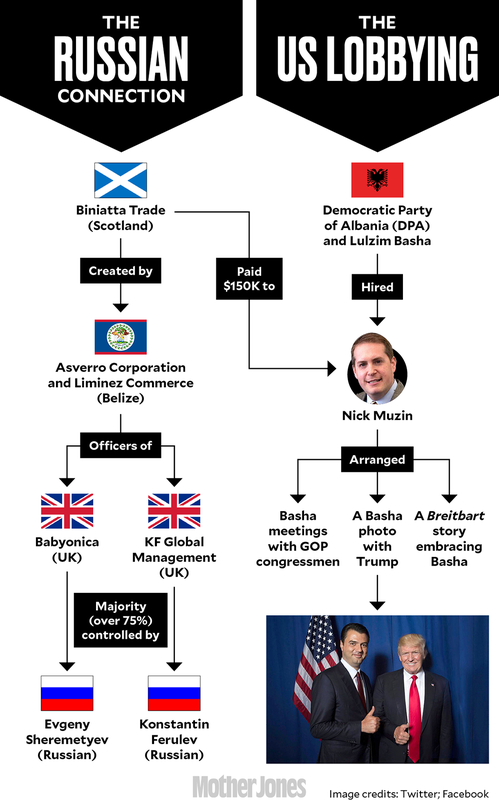 It’s a complicated story of international political skullduggery with a dizzying plot: A year ago, a sketchy Scottish firm called Biniatta Trade, which was formed by two Belize-based shell companies, paid a Republican lobbyist and former Trump campaign aide named Nick Muzin for work in the United States to help the Democratic Party of Albania. At the time, a parliamentary election was underway, and the right-wing DPA was challenging a government run by the Socialist Party. That government was led by Prime Minister Edi Rama, who was steering Albania into the European Union and warning of the rise of Russian influence in the Balkans. Coincidentally—or not—the two Belizean shell companies behind Biniatta Trade were both connected to firms controlled by Russians. The bottom line: It appears that Russian-related entities secretly meddled in the United States in order to meddle in an election in Albania. Last spring, shortly after the inauguration of President Donald Trump, Muzin, the veteran GOP operative at the center of this intrigue, embarked on a new career as a lobbyist. Muzin has a law degree from Yale and a medical degree from the Albert Einstein College of Medicine, but in recent years he held a succession of political jobs. In the early 2010s, Muzin worked for then-Rep. Tim Scott (R-S.C.) and the House Republican leadership. He went on to become deputy chief of staff for Sen. Ted Cruz (R-Texas) and a senior adviser for Cruz’s 2016 presidential campaign. After Cruz’s White House bid flamed out, Muzin joined the Trump campaign. Following the election, according to his online bio, he “worked with” the Trump transition team to recruit officials for the incoming administration. But Muzin did not enter the Trump administration. Instead, on March 31, 2017, he registered with the Justice Department as a foreign agent. His client: the Democratic Party of Albania. The contract between Muzin and the party, signed by Lulzim Basha, the DPA’s chairman, called for Muzin to promote the Democratic Party of Albania and the country’s conservative movement within the United States and around the world. It noted that Muzin would be paid $25,000 on the 22nd of the months of March, April, and May. Muzin contacted Stephen Bannon, then a senior White House adviser, and several other White House officials on Basha’s behalf. And he arranged for Lulzim Basha to be interviewed by Breitbart News. At the time, Albania was undergoing a bitter political campaign. For weeks, Basha’s DPA, which led the opposition, had been mounting protests against the ruling coalition headed by Prime Minister Rama and his Socialist Party. There was talk the DPA and its allies would boycott the June parliamentary elections. It seemed that Albania could be heading toward serious turmoil. And the DPA was turning to Republicans in Washington for assistance. In late March 2017, Muzin set up a visit to Washington for Basha that included meetings with three GOP congressmen: Ed Royce of California, who chaired the House Foreign Relations Committee, and Michael McCaul and Pete Sessions of Texas. Basha also met with Rep. Dana Rohrabacher (R-Calif.), who has been dubbed “Putin’s favorite congressman.” Basha attended the National Republican Congressional Committee’s annual dinner, which featured Trump as the big-draw speaker. Muzin also contacted Stephen Bannon, then a senior White House adviser, and several other White House officials on Basha’s behalf. And Muzin arranged for Basha to be interviewed by Breitbart News, the right-wing site that Bannon had managed before joining the Trump campaign in 2016. If Basha could round up support in the United States, he could trumpet that in Albania. And Basha was a natural for American conservatives. He was positioning himself as Albania’s Trump and pushing the slogan “Make Albania Great Again.” At one point, Basha even attended a ceremony in a central Albania town during which a street called Liria (“Liberty”) was renamed in honor of Trump. Basha went back to Albania, and eventually he and Rama worked out an agreement that permitted the Albanian parliamentary election to proceed. A week and a half before the June 25 voting, Basha returned to the United States—in search of more political assistance from Muzin and the lobbyist’s Republican contacts. According to a Republican political operative, Muzin brought Basha to a fundraiser in Milwaukee for Republican Gov. Scott Walker, and Trump was the featured speaker there. At this event—where a $20,000 contribution to Walker earned an attendee a VIP seat and a photograph with Trump—Basha managed to have his photo taken with the president. In Albania, the DPA widely disseminated the picture, showing a smiling Basha and a grinning Trump each flashing a thumbs-up. And Basha claimed he’d had an “extraordinary meeting” with Trump. Muzin declined to answer questions about this photo op or any of the particulars of his work for Basha and the DPA. Basha and the Democratic Party of Albania did not respond to an email requesting comment. The Trump magic didn’t work for Basha and his party. In the election, Rama’s Socialist Party gained seats and won a full majority of the Parliament—the first time since the end of communism in Albania in 1991 that a single party had assumed control without having to form a coalition. Muzin’s efforts on behalf of the DPA appear to have ended around this time. He soon picked up another client: the government of Qatar, for $50,000 a month. But on November 14, 2017, Muzin notified the Justice Department that he needed to amend the paperwork he had sent it nearly eight months earlier regarding his toils for the DPA. (Two weeks earlier, Paul Manafort and Rick Gates, two former Trump campaign officials, had been indicted by special counsel Robert Mueller on charges that included failing to disclose their work as foreign agents for a Ukrainian political party.) It turned out there was more to the Albania story than Muzin had initially reported to the Justice Department. Lobbyists working for overseas governments, parties, or other entities have to identify in their reports to the Justice Department their foreign clients and the fees they are paid, and they have to describe—if somewhat minimally—the work they are doing for these clients. But Muzin had not reported all the details when he first registered as a foreign agent for the Democratic Party of Albania. In his amended filing, Muzin noted that he had been paid $675,000 for his three months of work for the DPA. This included a $25,000 payment on March 27 and a $500,000 payment on June 9 from the Albanian party. Muzin banked this whopping $500,000 fee just days before he arranged for Basha to have that important photo op with Trump in Milwaukee. Yet according to this new filing, another source also paid Muzin for his DPA project. Muzin’s filing reported that on March 24, 2017, Biniatta Trade, a company based in Edinburgh, had “compensated” Muzin “for activities undertaken on behalf of the Democratic Party of Albania.” The payment was $150,000. This filing included an unsigned contract dated March 20, 2017 between Biniatta Trade and a Muzin company called Stonington Strategies. (The agreement referred to the company as “Biniatt Trade,” and though it was not signed, Muzin’s filing said it “reflects the terms under which the registrant preceded with the representation.”) The contract called for Muzin to promote the “Albanian-American business community’s role in the US economy” and “Albanian history month in the US.” It did not mention the DPA or Basha and stated “this consultation is not on the behalf of any government or political party.” Under this contract, Biniatta was to pay Muzin three installments of $150,000 each—and a $500,000 “onetime payment” for setting up a series of events and meetings in Washington in the first month of the project. Biniatta Trade, the company that signed a nearly $1 million contract with Muzin, has not left much of a public trail. Its website was registered by a resident of Odessa, Ukraine. To break it down: Muzin reported he had received $675,000 for his DPA job—much more than the $75,000 in the original contract with DPA. But part of Muzin’s amended registration form was at odds with the attached contract between his firm and Biniatta Trade. The filing reported that the Democratic Party of Albania (not Biniatta Trade) was the outfit that had made the $500,000 payment to Muzin. Yet it was the contract with Biniatta Trade (not the contract with the DPA) that included a $500,000 fee. And to make matters murkier, shortly after Muzin submitted his amended filing, the DPA told the Balkan Investigative Reporting Network that it had no “financial relationship” with Biniatta Trade and had only paid Muzin $25,000—meaning the $500,000 had not come from the party. Muzin’s spokesman says the lobbyist reported the payment accurately. But who is behind Biniatta Trade, the Scottish shell company? This is the heart of the mystery. There is little information in the public record about the firm, but a review of available records reveals ties to Russia. Biniatta Trade has a generic-looking website that, in poor English, says it is “world top class of Agro industry, textile and artificial fur material supplier specialising in high quality textile products for sportswear.” The site notes that the company serves “more than 300 businesses world widely.” Yet a Google search produced no accounts of any commercial activity of this sort on the part of Biniatta Trade. Its website does feature a list of clients, including Nightwood, a small business in Brooklyn that sells handcrafted home furnishings and textiles. But Ry Scruggs, the co-owner of Nightwood, says she has never heard of Biniatta Trade. The company named in a nearly $1 million contract with Nick Muzin has not left much of a public trail. According to British corporate records, Biniatta Trade is located at an address in Edinburgh that is used by 727 other companies. The British phone number listed on its website does not work. But this phone number is also listed as the contact number for a website called 2Love.Club, an “international online dating service” that offers “beautiful Ukrainian women for dating and marriage.” (This is not a traditional matchmaking site; it features women, mainly described as being in their 20s and 30s, for male customers to choose from.) When a Mother Jones reporter called the Ukrainian phone number for the 2Love.Club, the man who answered, speaking in Russian, said the number was for a private individual, not a dating service. An email request for information sent by Mother Jones to the Biniatta Trade site was not answered. The website for Biniatta Trade, according to the WHOIS directory of websites, was registered by a resident of Odessa, Ukraine, named Alexey Nikitin. His listed email is globaldeltatrade.host@gmail.com. As it happens, a company named Global Delta Trade that says it is based in Dubai has a website that looks much like the site for Biniatta Trade and uses nearly identical language to describe itself as a “world top class textile and artificial fur material, auto parts, electronics devices” supplier that serves “more than 300 businesses world widely.” Its client list is nearly identical to that of Biniatta Trade. Another company, Blackshire United, which is based in Edinburgh, has a website that resembles those of Global Delta Trade and Biniatta Trade and includes the same wording and a similar client list. Scruggs says her home furnishings firm—which is also listed as a client by Global Delta Trade and Blackshire United—has no connections to those firms. A Google search produced no information about either Blackshire United or Global Delta Trade other than their corporate registrations. And there are two other Scottish-based companies with similar websites—Contoform LP and West Berton Impex LP—that also do not seem to have a record of actual public commerce. Muzin’s spokesman says Muzin believed Biniatta Trade was a private company owned by supporters of the Democratic Party of Albania. But Muzin declined to explain how he had first come into contact with Biniatta Trade. And here’s the important question: Who does own this company that funded Muzin’s efforts for the DPA? British corporate records provide a tough-to-track trail that offers clues but no definitive answers. According to its own filings in the British registry of corporations, Biniatta Trade is a partnership created by two companies: the Asverro Corp. and Liminez Commerce. Each of these firms was incorporated in Belize and lists an address in Belize City associated with various shell companies. There is no public record of any commercial activity for either Asverro or Liminez Commerce. Neither appears to have a website. Both Asverro and Liminez Commerce, though, are corporate officers for two British companies controlled by Russian nationals. That means the available public record appears to link—albeit indirectly—Biniatta Trade to only two people, and each one is Russian. According to Russian corporate records, Sheremetyev owns a legal services company that won at least one Russian government contract. He also is a shareholder in two Russian firms involved in franchising Subway sandwich shops. On his Instagram account, Sheremetyev has posted one image of Babyonica’s products. In another post, he said he had the ability to organize business deals with contacts in the United States and told followers to message him directly for further information. A request for information sent to him from Mother Jones drew no reply. In December, Babyonica filed a request with the British corporate registry to be dissolved. On January 2, the Registrar of Companies reported the firm was slated to be dissolved on March 2. To recap: The two shell companies that formed Biniatta Trade—which underwrote the lobbying efforts of a top Republican operative working for the conservative opposition party of Albania—are officers of two other companies controlled by Russian nationals. What else is known about Asverro and Liminez Commerce? Not much. They have formed other shell companies that share the same Edinburgh address as Biniatta Trade. One partnership these two firms formed in 2016 had an especially peculiar feature. This Edinburgh shell company, called Talanta Business LP, submitted a filing to the British corporate registry noting that as of mid-June 2017, 75 percent or more of its assets and voting rights were controlled by Leryam Dvorkin, an American citizen living in San Francisco. Dvorkin does not seem a natural choice to control an overseas shell company. According to a personal profile he posted on a Russian social-media site called Odnoklassniki, Dvorkin, who was born in the Soviet Union, is 75 years old and once worked in Belarus for Gazprom, the large natural gas company partly owned by the Russian government. And his LinkedIn page notes he was an estimator for a small, local San Francisco company called Svala Construction. (His photos on Odnoklassniki mainly show him and a woman who seems close to his age in typical tourist shots.) When a Mother Jones reporter called a phone number listed for Dvorkin, a woman who said she was his wife answered. She sounded surprised when informed that he had been registered as the person controlling an overseas shell company. “In Scotland?” she asked in Russian. “He has no companies in Scotland.” Then she became angry, demanded the reporter not call her again, and hung up. Another relative of Dvorkin told Mother Jones that Dvorkin and his wife were once victims of identity theft and did not want to talk to reporters. Asverro and Liminez last year each became a partner of a Glasgow-based firm called AFG International LP, which reported its voting rights were controlled by a 35-year-old Russian national named Iurii Ivanov of St. Petersburg. From the scant public record, it is hard to tell what the Belize-based Asverro and Liminez Commerce do beyond forming shell companies in Scotland and serving as officers for at least two British firms controlled by Russians. The available corporate records do not identify the person or persons who control Asverro and Liminez Commerce. The Russian links of Asverro and Liminez Commerce, though, may well be relevant to the Biniatta Trade-Albania connection. Russia has long been at odds with Albania, refusing to recognize the independence of Kosovo, which in 2008 broke away from Serbia, Moscow’s ally, and which has a majority of ethnic Albanians. And Vladimir Putin’s government has been no fan of the EU and its expansion. The government of Albanian Prime Minister Edi Rama is one of the most pro-EU and pro-Western in the Balkans—and not on good terms with Putin’s regime. In February 2017, Rama warned of increasing Russian influence in the Balkans, noting, “Russian policies do not correspondent [sic] with Balkan ambitions to join the EU.” Weeks later—shortly before Muzin was retained by the Democratic Party of Albania and Biniatta Trade—Moscow accused Rama of conspiring with NATO and the EU to impose a pro-Albanian government in neighboring Macedonia. The Russian Foreign Ministry claimed that Rama’s government was attempting to expand its influence in Montenegro, Serbia, and Greece as part of a plot to create a Greater Albania. Soon after, Basha, the DPA leader, held a much-publicized meeting with the Russian ambassador to Albania, and that caused a row. “It was a shift for a major politician to openly engage with Russia,” notes Fred Abrahams. “Because of the rampant pro-Americanism in Albania, it would have been unthinkable for a politician to do that before.” Rama accused the opposition of being supported by foreigners. The Biniatta Trade payment to Muzin raises an obvious possibility: a Russia-connected source provided money through a shell company to help the Democratic Party of Albania and to fuel the ongoing political discord in Albania. That is, Russians might have used the American political system—and Washington’s swamp—to intervene in Albania. Muzin’s spokesman says no Russian connection of any sort came up during his work for the DPA. Allaham was a curious pick for this project. He had no experience as a lobbyist. Born in Syria in 1974 to a family of kosher butchers and now an American citizen living on the Upper East Side of Manhattan, Allaham had built a business empire of high-end kosher restaurants in New York City that in recent years had collapsed amid a series of legal disputes. He now runs the Allaham Consultancy, which he describes as a “diversified real estate consultancy.” On his website, Allaham boasts of brokering a 2010 meeting between Syrian President Bashar Assad and Malcolm Hoenlein, the executive vice chairman of the Conference of Presidents of Major American Jewish Organizations. There is no mention of any expertise related to the Balkans. Muzin’s filings did not detail what Allaham did to earn that $52,000 payment. (According to the Justice Department registration, Allaham “assisted with promoting the visions and goals of the Democratic Party of Albania to business and political leaders in the United States.”) In a brief phone interview with Mother Jones, Allaham said he had been hired by Muzin as a consultant. Asked what he had done for the Democratic Party of Albania in that role, he said, “Consulting, that’s what I did.” What kind of consulting? Did he set up meetings? Talk to members of Congress? “It’s consulting,” Allaham replied. “That’s all I can say.” Had he ever done any lobbying before? “No,” he said, “never done any lobbying.” Did he have any familiarity with Albania? “No,” he answered, “never been there.” And did he know whether the money he received had come from the Democratic Party of Albania or Biniatta Trade? At that point in the interview, Allaham declined to answer any other queries and asked that further questions be emailed to him so his lawyer could review them. He did not respond to a subsequent email. Muzin declined to answer questions about his contractors on this project. The purpose of the Foreign Agents Registration Act, which was passed in 1938 to counter Nazi propaganda, was to make sure that lobbyists for overseas governments and entities provide information that allows Americans to know what foreign players are doing within the United States to influence the US government and public. In this curious case, the documents submitted to the Justice Department stir more questions than they answer. The big one: Who financed Muzin’s effort in the United States to help the Democratic Party of Albania? The available evidence suggests a troubling scenario: Russian-connected outfits clandestinely messed about in Washington in order to pursue a covert agenda in Albania. The US intelligence community last year concluded that Putin intervened in the 2016 election with hack-and-dump operations and other underhanded and illegal measures. Mueller recently issued an indictment of 13 Russian nationals that described how Moscow waged a secret propaganda campaign to affect the election and help Trump via social media. The Biniatta Trade-Albania caper is a possible warning that Russian undercover political warfare might go even deeper. Additional reporting by Anna Levinsky of RBC (in Moscow).